Watching from the sidelines as kids develop their talents and passions. I’ve written before about whether you can let your kids quit something. Georgia is my sweet tiny baby pumpkin face, though, and I probably let her get away with too much. I obviously make her do things she doesn’t want to do – all she ever really wants to do is watch weird kids’ shows on Netflix while eating Nutella by the spoonful – but in terms of extracurricular activities, I just couldn’t bring myself to force her to continue conscripted pliés. With Ruby, it’s been a different process and one that I, as a mom, find pretty exciting because it’s all part of watching her discover her talents and passions. Her first instinct was to rush headlong into everything: soccer, volleyball, softball, basketball, lacrosse, cheerleading, drama, choir, speech and debate. I’ve supported her in all of this, sat on uncomfortable bleachers in unfamiliar gyms trying to follow what was going on and clapping when everyone else clapped, bought costumes and uniforms and sports equipment that now clutters my attic, cried during her Shakespearian monologues, listen to her sing “The 12 Days of Christmas” until I thought my ears would bleed. But now, she begins the second phase of this process – discerning which of these activities she wants to pursue on a deeper level and which she is going to have to leave by the wayside because of time constraints. As she gets older, the commitment required is greater, and so she simply can’t do all of these things (and realistically, she is clearly better at some than others). 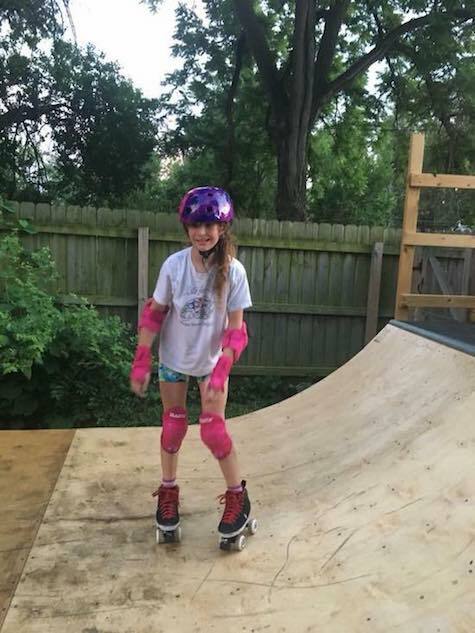 She has already abandoned soccer and lacrosse and is about to make the difficult choice to give up volleyball in order to focus on cheerleading and the school play and – the new arrival on her radar – roller derby. One of the things I love about Georgia is how much like me she is. We’re introverts who prefer to stay home, we love carbs, we’re anxious and risk-averse and nonconfrontational, we have to sleep with our feet uncovered. One of the things I love about Ruby is how different from me she is. She’s an extrovert who loves sports and public speaking and parades and parties and crowds. Another major difference, and this is a very good thing, is that Ruby is far more comfortable with failure than I ever was or ever will be. She is a risk-taker who is willing to be bad at something until she gets good at it. I love watching her grow. I love watching them both grow. Seeing them unfold as the people they are is the greatest privilege; sitting on my hands during that process is the greatest challenge. Although Georgia really is an expert at eating Nutella. Friends with kids ages 6 to 17: If roller derby is something your kid might dig, please like Crescent City Crushers on Facebook to learn more. There's a meet-up on Sept. 9, and Ruby Bruiseday and I will definitely be in attendance.